Having experimented with the Main Borders at Harlow Carr and gaining experience of sustainable herbaceous border management at Cambo Estate, we wanted to do our own experimentation into developing beautiful but low maintenance and sustainable borders. 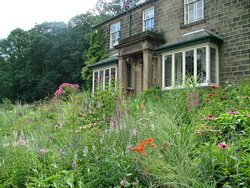 Important considerations when designing a new border are how well the plants compete with each other, choosing plants which are self-supporting (so staking is not required), and selecting plants for their winter interest, such as Allium, whose ornamental seed heads can remain standing all through the winter. Planting density is high to ensure the ground is quickly covered in the spring to reduce weeding and watering requirements. The plants create their own microclimate which persists into the winter, sheltering and feeding many of the microorganisms that keep the soil healthy. Ideally the material cut back from the beds in the spring is chopped up in situ and left as a mulch returning the organic matter to feed the soil. Plants are allowed to self seed and are selectively weeded out. Verbena bonariensis can be left to grow amongst most plants, but Digitalis sp. 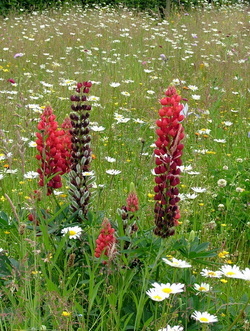 (Foxgloves) can quickly swamp out other plants and so are only left in selected locations. We are constantly trialling new combinations but each design we create is specially formulated depending on soil type, aspect and location. 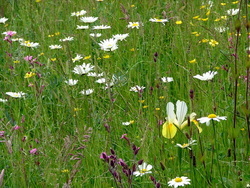 Our new and relatively small flowery mead is a good demonstration of meadow planting feasible for any garden. Grass management doesn't have to be high maintenance and can still look appealing, while at the same time providing a terrific habitat for a multitude of flora and fauna. Regularly mown turf is sterile and of little use to wildlife. In our meadow we will continue to mow any access paths but leave the rest of the grass untouched. In its first year we already had many species of wildflowers appearing, such as stitchwort, buttercup, clover and daisy. Of course some of these are considered lawn weeds but are very attractive en masse, and important food for bees, hoverflies and other pollinating insects. 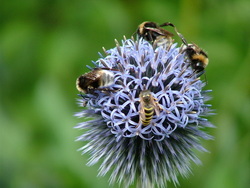 Attracting pollinators is very important if growing vegetables nearby that need cross pollinating in order to set fruit, like peas, beans, squashes and courgettes etc. The longer grass also provides important habitat for frogs, toads, ground beetles, birds, voles, hedgehogs and many other predators that help keep those slug and snail populations under control. The management of this area is simple as we only need to cut it once a year on a dry day in September. We then leave it to dry for a week or so before raking off the grass for composting. Tossing the piles of grass before raking will ensure dispersal of any trapped seeds. It is important to keep leaves off the meadow which would otherwise smother and kill germinating seedlings. No feeding is required as we only want to encourage narrow-leaved grass species and therefore maximise the number of wildflower species able to colonise. Yellow-rattle (Rhinanthus minor) is a parasite of grass so establishing it will also help to reduce the vigour of competing broad-leaved grass species. Last year we collected seed of wildflowers from around our smallholding including Red Campion (Silene dioica), Oxeye daisy (Leucanthemum vulgare) and buttercup (Ranunculus sp.). The seed was sown fresh and germinated very readily. The seedlings were pricked out into ‘plug' trays and planted out into the meadow when the hay was cleared away. Why stop at natives? We have also naturalised non-native plants into the meadow for added interest, including bulbs like Quamash (Cammasia leichtlinii), scillas, muscari, alliums, scented pheasant-eye narcissus and wild tulips (Tulipa sylvestris). We are also trialling the competitiveness of lupins (Lupinus Russell Hybrids), geums, candelabra primulas and a cultivar of our native cow parsley (Anthriscus sylvestris ‘Ravenswing').